A kitten, believed to be about 6 weeks old, is now being cared for by the Animal Rescue League of Iowa after being found this week in the trash. ARL Director Tom Colvin says the baby girl kitten, now named “Alley,” was one of six kittens found by Waste Management workers in Des Moines early Wednesday morning. “They were found in a garbage bag…when one of their trucks came in and dumped its load,” Colvin said. Alley was the only kitten still alive. Colvin says Alley is very fortunate, not only to survive, but also because she seems comfortable around people and will eventually make a good pet for a family. “Alley, fortunately, is very trusting of people, definitely likes people and always feels better when she’s around people,” Colvin said. That’s not always the case with abused or neglected pets that end up in animal shelters. 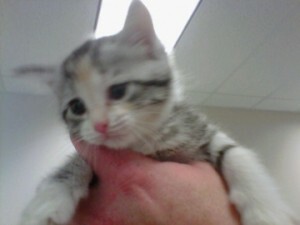 This is the second time in a year Polk County Waste Management employees have found kittens who were thrown away. All of the kittens found in the first case were dead at the time they were found. The Humane Society of the U.S. and the Animal Rescue League are offering a $3,000 reward for information leading to the arrest or conviction of the person responsible for dumping Alley and the other five kittens.